(Author: Melpomeni Maragkidou, Vice, 22/4/2015. This article originally appeared on VICE Greece). 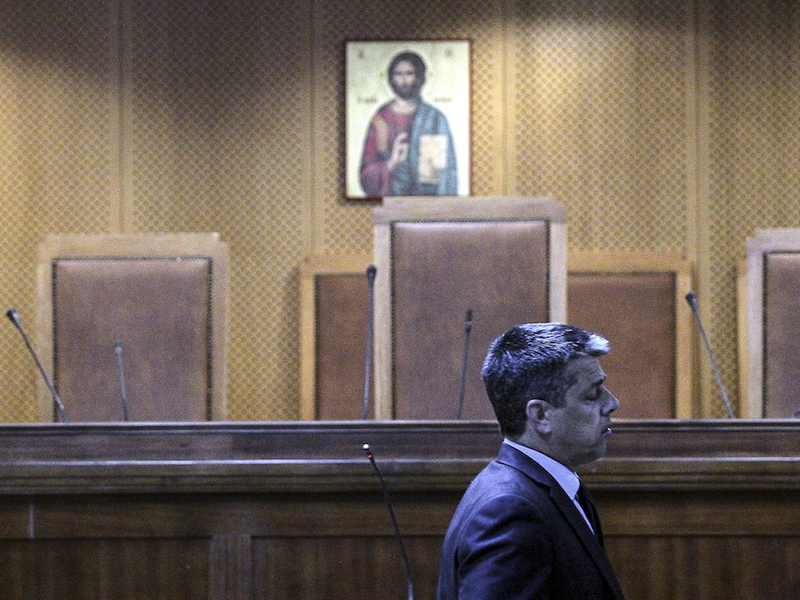 On Monday, 20th of April, 2015, one of the most important trials in modern Greece’s history began. For the first time, both the leadership and members of neo-Nazi party, Golden Dawn, stood trial for belonging to a criminal organisation. 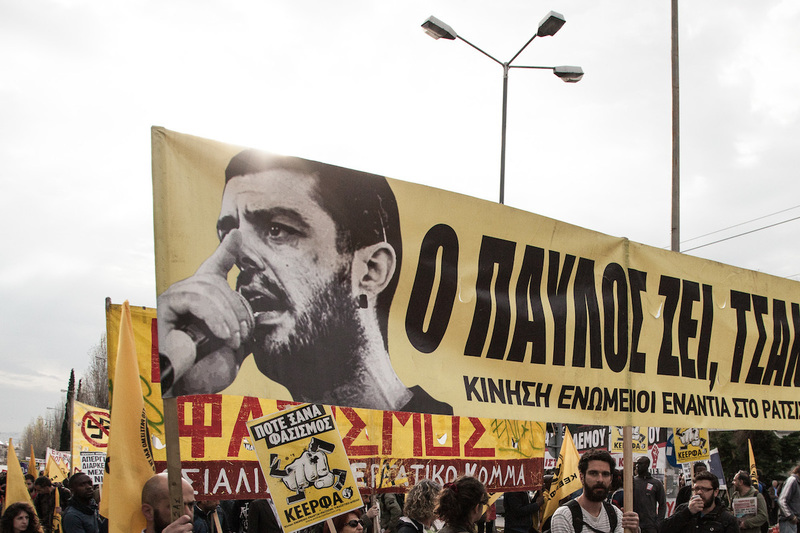 Golden Dawn, which, amongst other things, is responsible for attacks on immigrants, members of the LGBT community, anti-fascists, trade unionists and the deaths of anti-fascist rapper Pavlos Fyssas and Pakistani labourer Sachzat Loukman, will come face to face with the Greek Justice system. The defendants are all charged with specific criminal acts, such as murder and attempted murder. 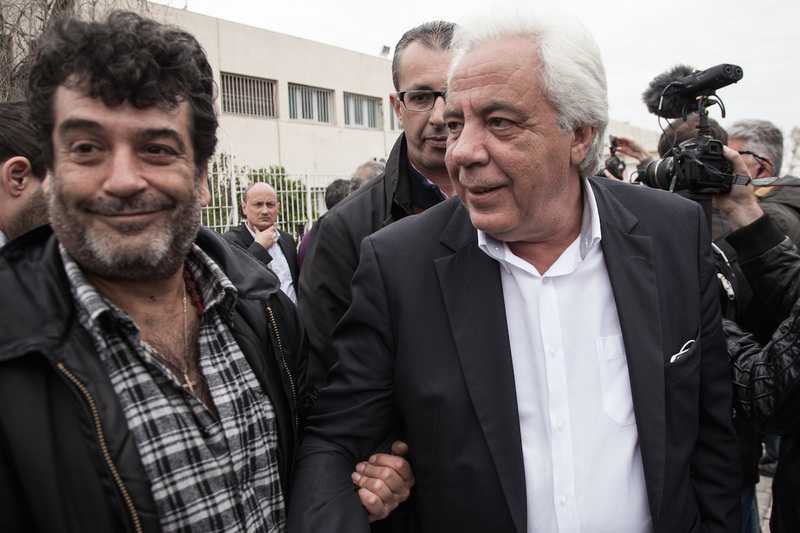 Immediately after the 2013 murder of Pavlos Fyssas, the leadership and members of Golden Dawn were arrested, after court officials compiled a 15,000-page dossier detailing the actions of the organisation, since 2008. 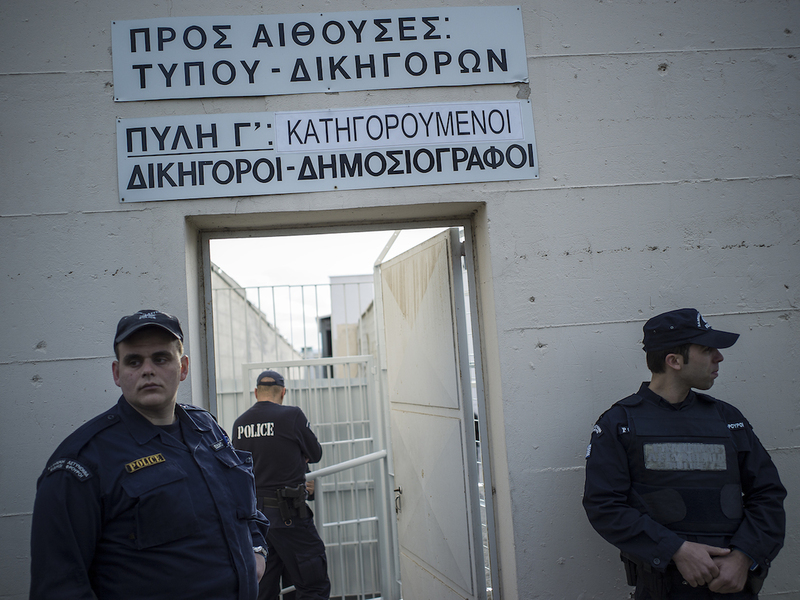 Following a nine month inquiry, the Appeals Council decided that 69 people, amongst them all current members of the Parliamentary Group of Golden Dawn, would be tried for belonging to a criminal organisation. 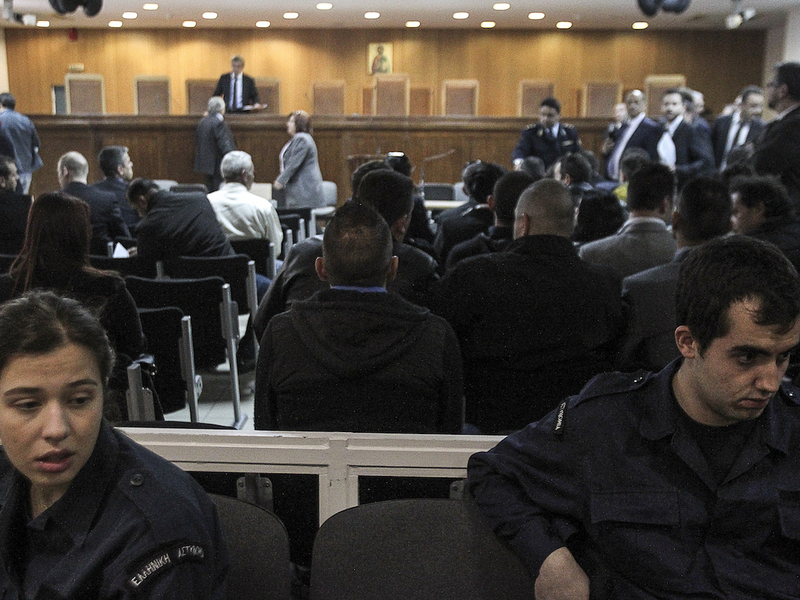 On the first day of the trial, Golden Dawn appeared visibly weakened but nonetheless provocative, both inside and outside of the courtroom. The trial was started with a formal complaint issued by civil action advocates, who “photographed” five people as they attacked two witnesses belonging to the family of the murdered Pavlos Fyssas, while on their way to court. Outside the courtroom, Golden Dawn, who garnered enough votes in the last national election to make them the country’s third largest party, failed to rally its forces. Despite the importance of the trial, only a few dozen people showed up for support. 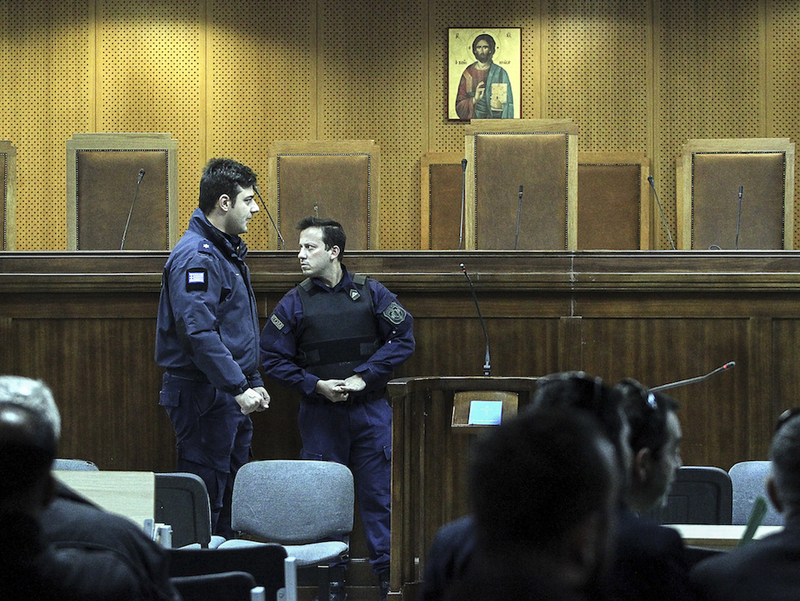 Inside the courtroom, which was crowded with lawyers and journalists, the accused MPs – including leader Nikolaos Michaloliakos – were absent. Only 44 of the 69 accused were present. 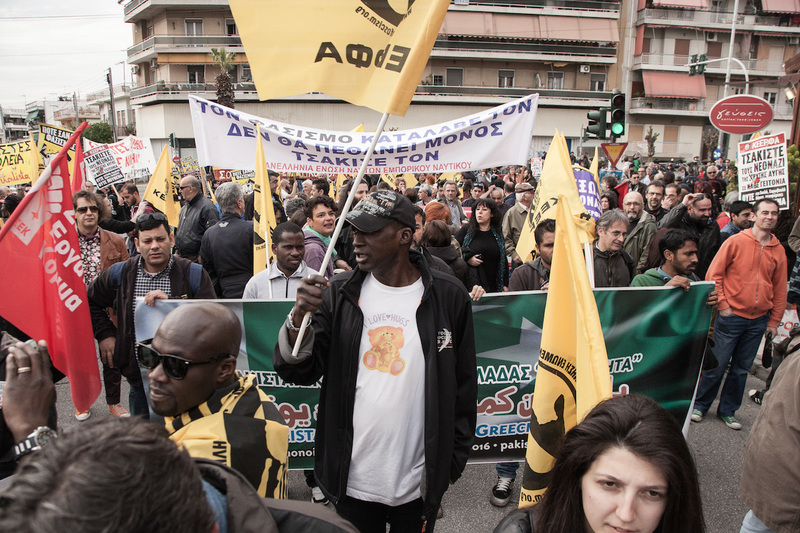 The beginning of the trial spurred a number of anti-fascist protests throughout Greece. 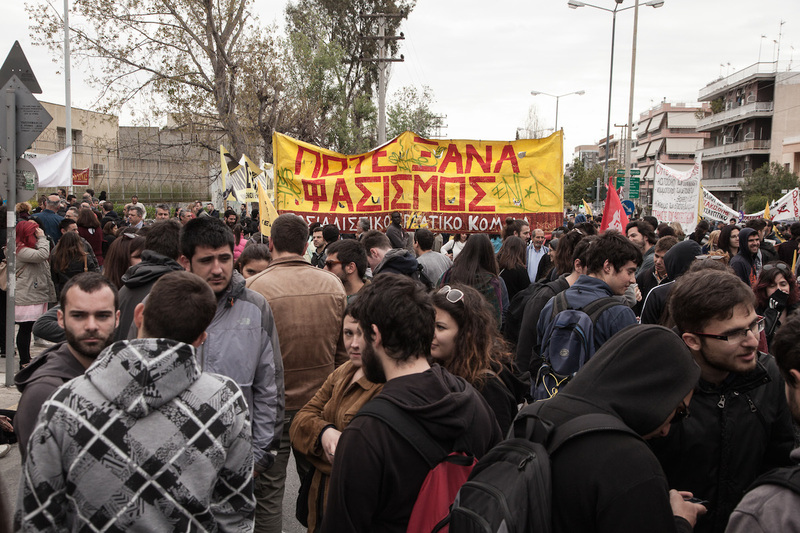 Protesters began arriving to Fyssa’s neighbourhood Korydallos from early on in the day, responding to the anti-fascist callout that had been made to mark the beginning of the trial. 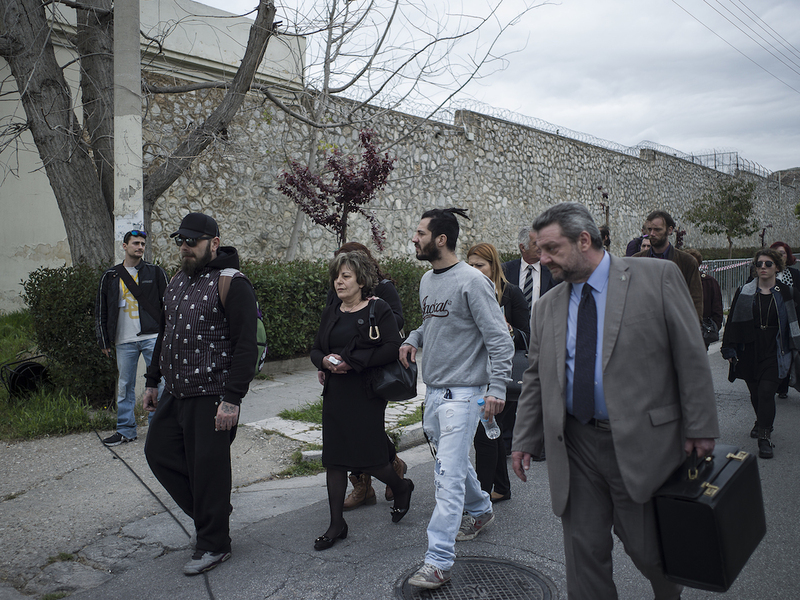 The family and friends of deceased Pavlos Fyssas were present in the heavily policed courtroom of Korydallos prison, from the very start of the proceedings. No additional measures had been taken to ensure that they wouldn’t come into contact with the members, witnesses or lawyers of Golden Dawn. Allegedly, due to the large number of defendants, witnesses and lawyers, it has been difficult to find a suitable space to carry out the long-awaited trial. On the day that Korydallos prison was announced as the venue, both the council and the local community reacted. Many have described the courtroom as failing to meet the necessary standards to ensure proper conduct during the proceedings. The prison is placed in a neighbourhood that houses 11 schools and is located just metres away from the area where Golden Dawn committed the crimes that they’re currently being tried for— the murder of Pavlos Fyssas in Keratsini, the assault of three Egyptian fishermen in their homes in Perama and the attack on members of PAME (Trade Unionist Association of the Communist Party in Greece), also in Perama. The attack on the two witnesses and the overly packed room only served to reinforce the objections that have been made. Journalists complained that they were only given about 50 seats, and weren’t provided with adequate amenities – such as plugs or wi-fi. Some even threatened to leave the proceedings due to the poor acoustics of the room. The prosecutor stressed several times that the trials venue had been appointed by the Minister of Justice, and that the Athens Court of Appeals is currently booked for other trials. It was, however, mentioned that a solution would be found along the way. 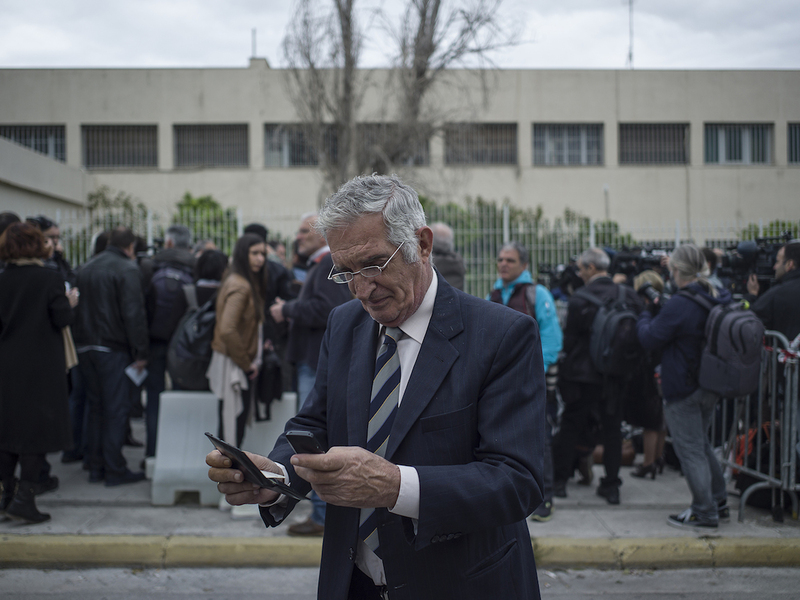 After a short minutes break following a report from Pavlos Fyssas’ family lawyer that elements of the assembled crowd had ambushed and attacked students, some of whom were witnesses, the witness list was finally called. Pavlos Fyssas’ friends and family sat in the public boxes right behind the journalists. This was the first time that they have shared the same room as prisoner Giorgos Roupakias, who Pavlos Fyssas himself pointed out as his murderer, right before drawing his last breath. This was also when the five protected witnesses declared themselves “present” via telephone, using names like “Witness A”, “Witness B”, etc. As the proceedings drew to an end, one of the accused took out his cellphone and pointed it towards the audience, as if to take a picture or begin videotaping. This was met with reactions onlookers. 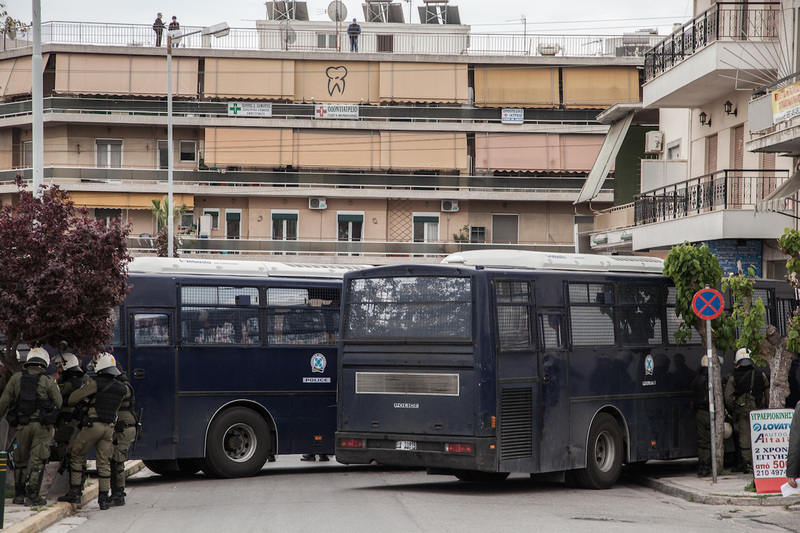 The court was forced to postpone proceedings when Nikos Papavasileiou – on trial for belonging to a criminal organisation that has been convicted of arson attacks targeting immigrant bars in Agios Panteleimonas – stated that he had no legal representation. He was later appointed one by the court. The retrial is set to take place on May 7th at 9:00AM and will be held in the same courtroom. “The trial has had a rocky start. Witnesses of the prosecution have suffered injuries. The family of Pavlos found themselves in the same room as Roupakias and naturally they are devastated. 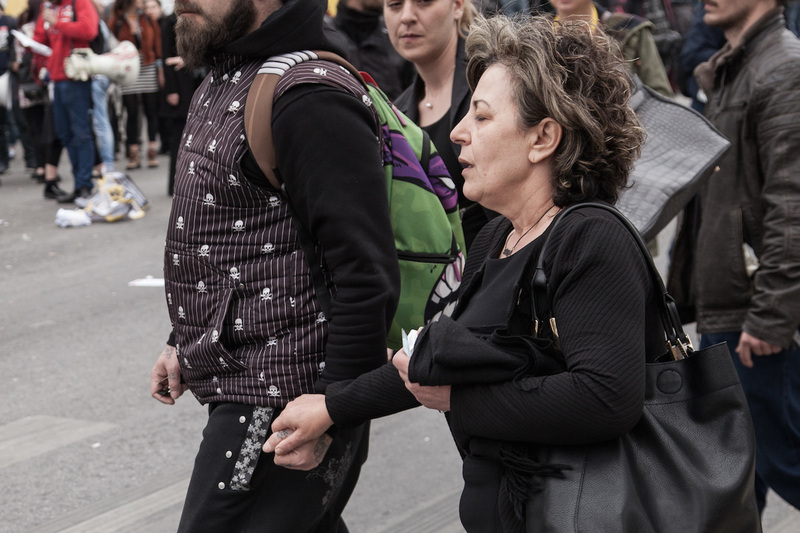 And it’s already been almost 19 months since Pavlos was murdered”, Pavlos Fyssas’s family lawyer Giorgos Maragos told VICE after the trial had ended. 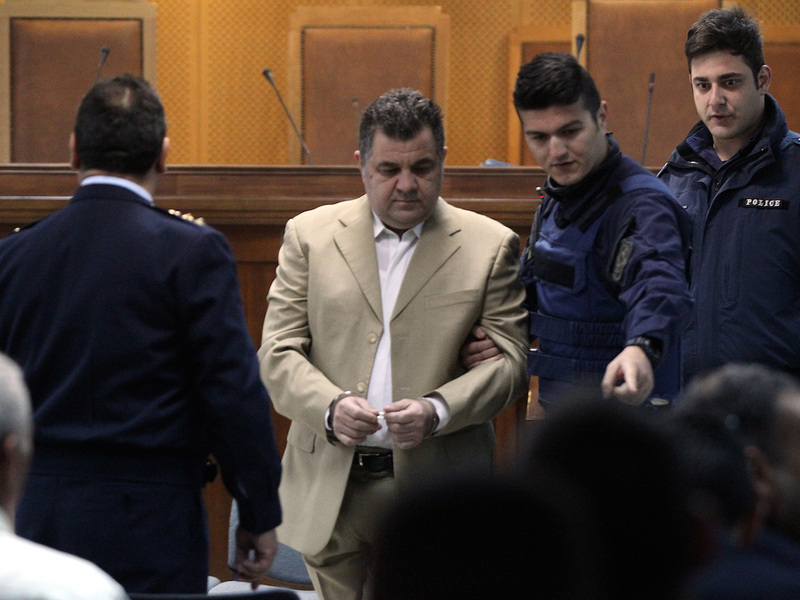 Kostas Papadakis, a member of the prosecution, told us: “We cannot overlook, the contemptuous attitude of the leadership and the parliamentary wing of Golden Dawn, who chose to exercise their procedural right for representation by proxy, instead of coming here and confronting their victims and the court face to face. Beyond that, I think the issue of moving the trial away from Korydallos was well argued, and the pressure exerted from all sides was felt by both the court and the Ministry. We are confident that on the 7th of May this will indeed be achieved. We will continue this trial, louder, everyday”. Thanassis Kampagiannis of the prosecution also added: “Today, the list of the accused and the witness list were both called out. The attack on the two witnesses, who were unable to attend the trial, is something very serious and we await the details of this case. The most important thing is that the trial process is not de-politicised, something which was very evident during today’s proceedings. The prosecution’s priority is to get the trial moved elsewhere without further postponement”. “I condemn the presence and actions of Golden Dawn in Korydallos, and I also condemn the conduct of the police forces, who shut down the entire region, making the daily operation of the municipality impossible. 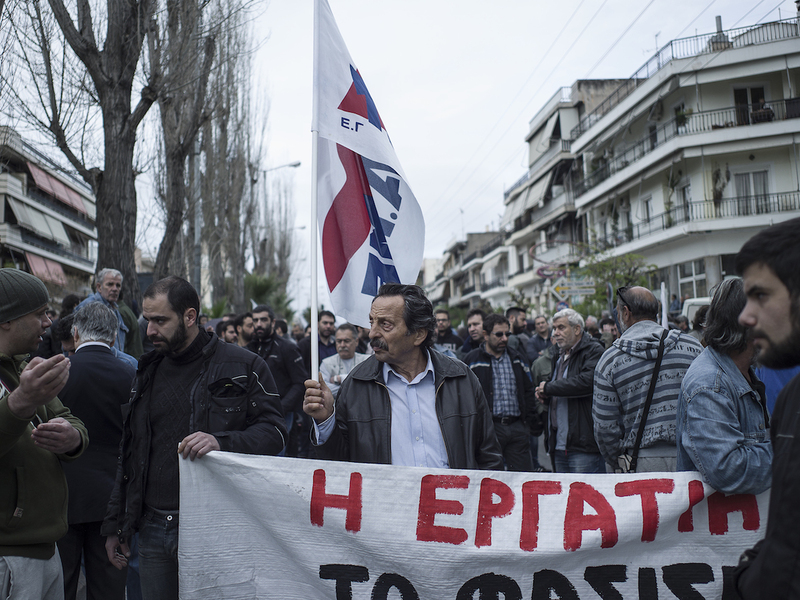 We invite all anti-fascists to return here on 7th of May”, said Korydallos’ mayor, Stavros Kasimatis. 23/04/2015 in International, Δίκη Χρυσής Αυγής.